There are few occasions in life more nerve wracking than meeting your boyfriend’s parents mother for the very first time. Luckily for me, my boyfriend eventually became my husband, so my now mother-in-law is stuck with me indefinitely (whether she likes it or not!). But little did she know that that first meeting (as well as many subsequent meetings after that), were some of the most anxiety-ridden of my life. (Come to think of it, perhaps she DID know and simply delighted in my discomfort until I eventually came to my senses). You see, my then-boyfriend hyped his mother as this tough-as-nails tomboy; a true badass that raised three rambunctious boys and could build stunning furniture from scratch that gives Restoration Hardware a run for its money. Not to mention, she’s a fantastic cook whose food is intensely craveable and comforting. Oh and she’s also smart and independent, and knows about things like finance, real estate, and taxes, because WHY WOULDN’T SHE. Renaissance woman, much? Before we met, I worried. A lot. I worried because I really, really liked, er, loved her son (though I hadn’t told him yet). I worried because her approval meant so much to me. And I worried because on paper, we couldn’t be further apart. She, the badass, and me…the girly girl who worships hot rollers and may or may not have a different pair of Hello Kitty pajama pants for each season. The girl who couldn’t cook anything other than Buffalo Chicken Dip and boxed brownies, so that’s what her son and I had eaten for three weekends in a row. (Note: a different story for a different time). In all honesty, I don’t remember too much about the specific details of our first meeting, only that we all ate Italian food and I was NERVOUS AF to meet everyone (I forgot to mention that I also met his grandma and his oldest brother that night, because WHY NOT add to an already stressful situation by giving me more people to impress?!). I had my guard up all throughout dinner; only relaxing when his dad offered me a plate of fried ravioli and instinct took over. At the end of the night, I knew his dad and I were going to get along swimmingly due to our shared love of Things That Are Fried But Shouldn’t Be, but try as I might, I couldn’t get a great read on his mom. She gave me a hug, but I attributed this to general decency and politeness and nothing that I had done or said specifically to inspire such a reaction. As I usually do, I overanalyzed the entire evening and made up a version of events in my mind in which I’d completely ruined everything, and thus I decided later that night on the comfort of my couch (Hello Kitty pajama-clad), that I’d make it my life’s mission to win over his mother. This decision set into motion a series of events and interactions in which I tirelessly sought her approval by being the best version of myself I could be (ie, the version of myself that I thought she’d like the most). Every time we saw his parents after that, I censored my true self. I took it easy on the hot rollers and winged eyeliner, and made it seem like I was adventurous and down for anything (when really I just wanted to lay around and eat snacks all day). Eventually, all the masquerading really took its toll on me, and the stress culminated on one hot summer day in the sleepy beach town on Lake Erie where my future in-laws grew up. My then-boyfriend and his mother decided they wanted to go to the beach and walk out on the pier, which I saw as yet another opportunity to prove my worthiness and sense of adventure. Well, once we reached the pier, they decided we should scale the rocks, which hovered probably 12 feet or more above these menacing, crashing waves. I have an intense fear of heights and also drowning (did I mention I can’t swim? Because OF COURSE I CAN’T). I’m also 99% sure I was wearing Steve Madden wedge sandals, because sometimes when you’re a girly girl pretending to be casual THERE ARE CRACKS IN THE LINING and you forget that wedges aren’t actually reasonable footwear. I didn’t want to do it. In fact, I was terrified. I wanted to cry (and I may have, just a little bit). But then I took a deep breath, feigned bravery, and did it. I scaled those rocks like my life depended on it. I didn’t do it for my future husband. Or for the innocent people on the beach who would undoubtedly see me fall to a certain death. I did it for her. Because she was the most important. And I didn’t want her to think I wasn’t good enough. Or worse, some sort of prissy pants. It was then and there, on the edge of Lake Erie, that I said to myself, ENOUGH. The stress of fronting as a normal person was just too much, and I decided that I just needed to be my crazy self, Hello Kitty pajamas and all. And you know what? From that moment on, my MIL and I became the greatest of friends. I stopped worrying that I would disappoint her and instead focused on getting to know her (and alternatively, letting her get to know me). Truthfully, writing this post was somewhat of a challenge because it’s hard for me to imagine our relationship as being anything other than it is now – which is totally open, comfortable, and crazy fun. We have a lot more in common than I ever would have thought, including but not limited to our love of: trash television, fashion blogs, spicy snack food, shopping for oddball antiques, and of course – ice cream. (The name always makes me giggle). The Nut Dip is from the Pied Piper, which is one of my favorite ice cream shops in Ohio. It’s where you can get amazing, old school treats, things like an Orange Twist and thick, malted shakes. 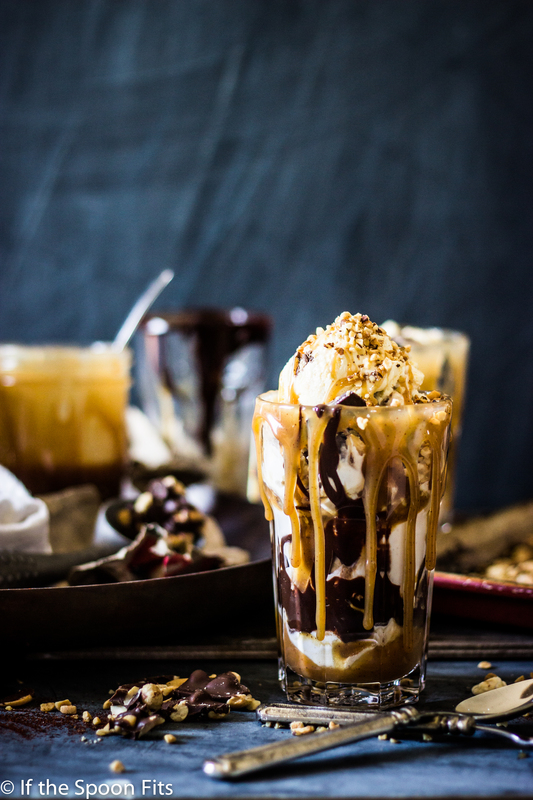 The Nut Dip has layers of vanilla soft serve, chocolate syrup, and crispy, chocolate-covered nuts, all topped off with dallops of fluffy whipped cream and chocolate shell. It’s a delicious combo and fan favorite that the entire town of Huron, Ohio will line up for on a Friday night (I know this because I’ve been in said line before…and let me tell you it is worth the wait!). 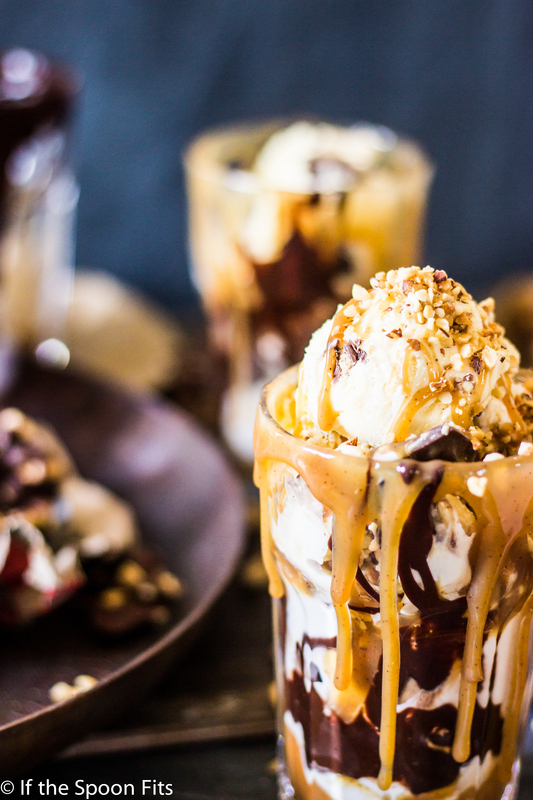 But, just a plain old Nut Dip Ice Cream seemed a little too boring for my MIL, so I decided to give it a touch of sass with some spicy caramel ribbons, inspired by her love for spicy snacks. The spice in the caramel comes from just a touch of chipotle chili pepper, and it’s rounded out with a healthy pinch of smoked sea salt. I swapped the chocolate syrup for hot fudge, and made my own “Magic Shell” which I then proceeded to dip my nuts in (tee tee) before allowing them to set in the freezer. 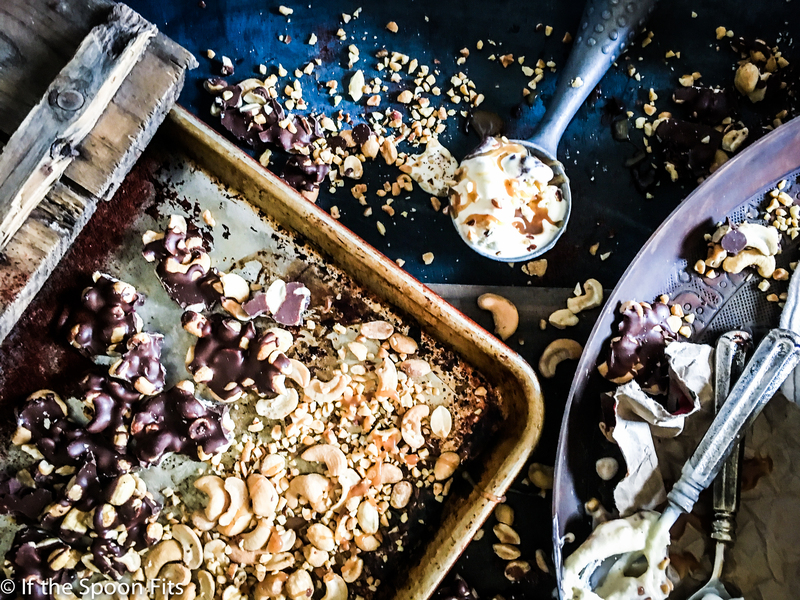 The result was similar to a chocolate bark (see below), but with a more forgiving snap, perfect for layering throughout the vanilla ice cream base. 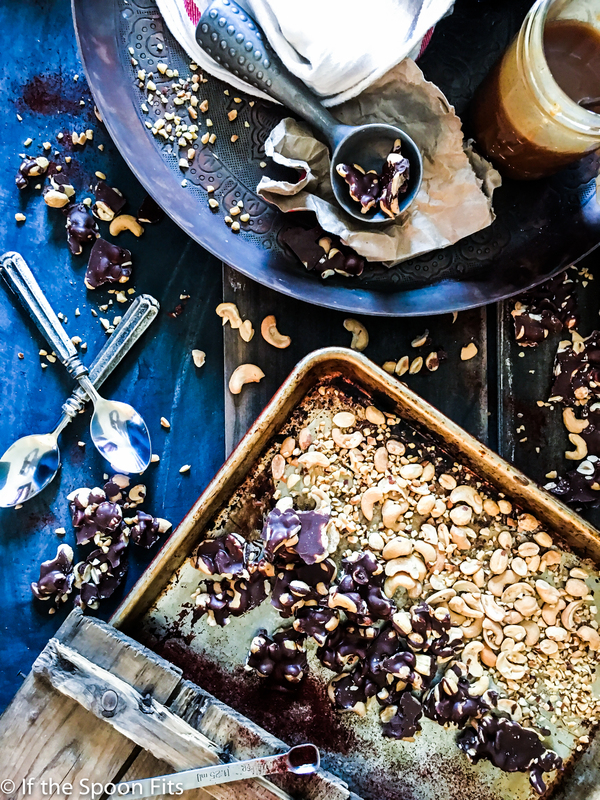 The salty, chocolate-y nuts with the spicy caramel is bold, unexpected, and delicious. So, I dedicate this post to my super awesome, tough-as-nails mother-in-law. But because you can’t actually put nails in ice cream, instead I made some spicy, badass caramel sauce. You can leave out the spice if that’s not your thing, just be sure to eat this ice cream while doing something hard-core. In a medium sized bowl, lightly whisk your egg yolks and set aside. In a medium saucepan over medium heat, heat the cream, milk, sugar, and salt until it just begins to steam. A little at a time, pour the warmed cream mixture into the yolks, whisking constantly until all of the cream is incorporated. Pour the warmed yolk mixture back into the saucepan, and continue cooking for ten minutes or so, until the mixture thickens into a custard (if using a wooden spoon or rubber spatula, the custard should stick to the back; when you wipe your finger across, there should be a clear “path” through the custard). Once finished, strain your custard through a mesh sieve into a bowl or storage container. Stir in the vanilla extract until fully combined. Store mixture, covered, in the fridge until thoroughly chilled, preferably overnight. Line a baking sheet with parchment paper or a nonstick baking liner. 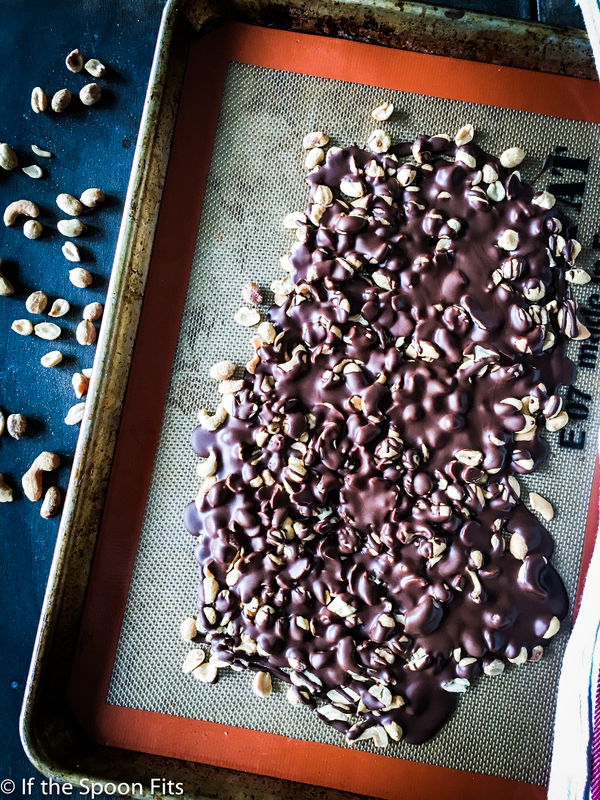 Spread the nuts onto the pan, then pour the chocolate shell over top. Place in the freezer until completely set, half an hour to an hour. Once set, chop the bark into rough pieces, and keep in a storage container in the fridge until ice cream is ready to assemble. Add the sugar to a medium sized saucepan, then pour water over top; no need to mix together. Texture should be that of wet sand. Bring to a boil over medium high heat, and let boil until miture reaches a deep amber color and smells amazing (for me, this was about 15 minutes). Remove from heat, and VERY CAREFULLY begin whisking in the heavy cream, just a little at a time. The cool cream will cause a ton of hot steam to rise from the boiling sugar, which can be dangerous. Once all the cream is incorporated, stir in the butter until melted. Then, start adding the chipotle and smoked salt. I would start off slowly here with both and taste as you go. I found that about a 1/4 tsp of the chipotle was enough to give you a nice slow burn in the back of your throat, but wasn’t overly spicy. 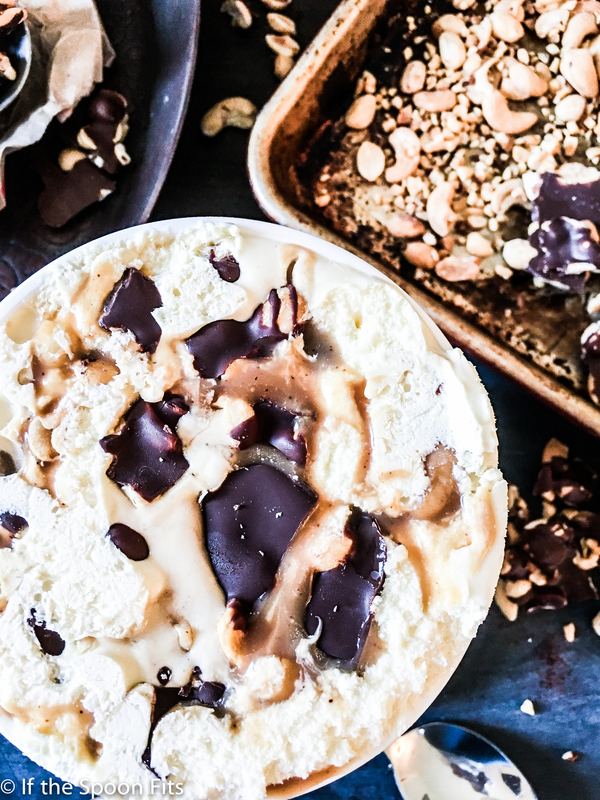 Let rest on the counter until cooled, then store in the fridge until it’s time to assemble the ice cream (leftover caramel will stay good in the fridge for up to three weeks). Freeze the ice cream base in your machine according to manufacturer’s instructions. 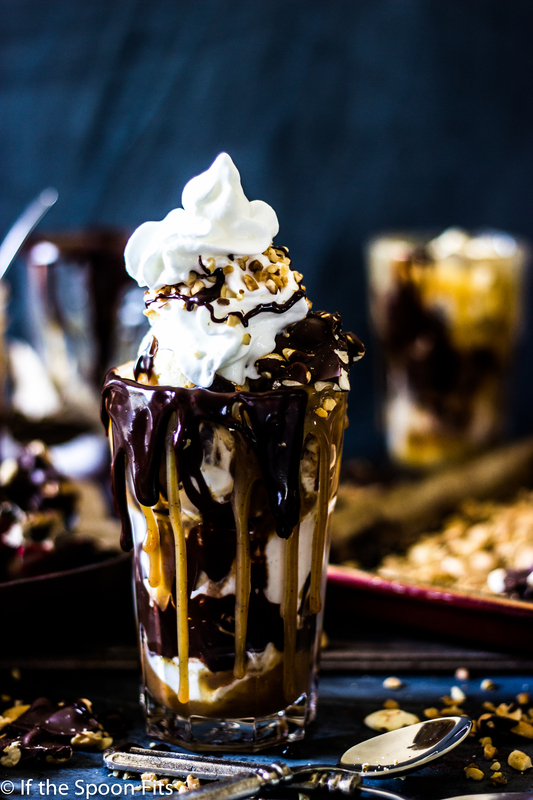 Spread hot fudge on the bottom of your ice cream container. 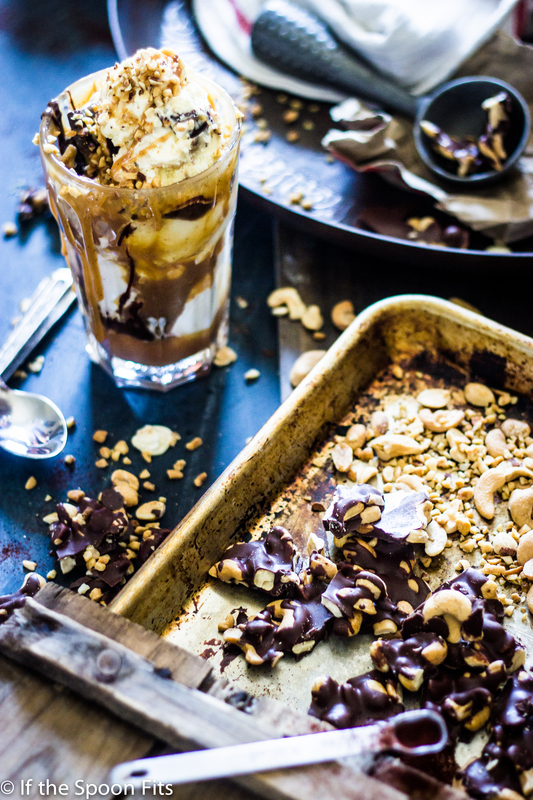 Then add a layer of ice cream, a layer of Spicy Caramel, a layer of Nut Dip Bark, then repeat. 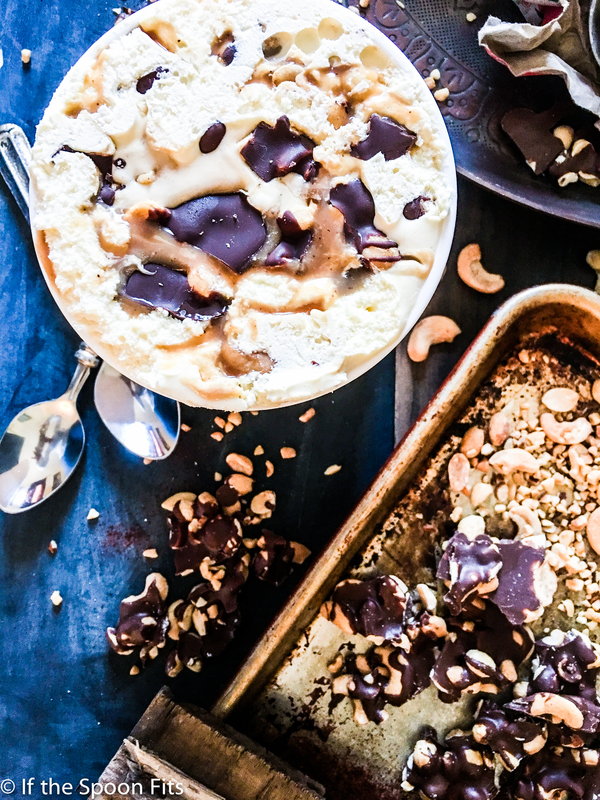 Layering this way ensures you’ll have fudge, caramel, ice cream, and Nut Dip Bark in every scoop once the ice cream is set. What a great & fun post! I always enjoy your writing but this was especially entertaining. The ice cream production looks beautiful. I wouldn’t be able to taste the spice though. Of course it is, because you love being the center of attention!! 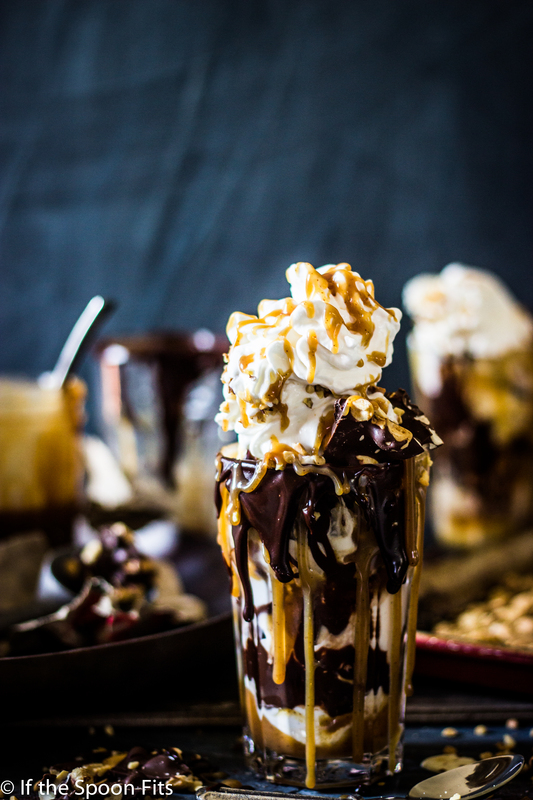 This recipe sounds incredible, and I LOVE the addition of the spicy caramel!! YUM! Thank you thank you!! PS I MISS YOU !! !